I'm back with another Favorites post. This one has to do with that perfect glowy cheekbone look that we all know in love. How did it get there? Well most people have a little help with the proper placement of cheek highlighters. I have a post chocked full of my favorites for myself and my kit. Check it out! MAC soft and gentle - This is my personal go-to highlighter. I'm surprised that it works so well on up to tan skin tones b/c in the pan it's pretty light. You've got to try it! 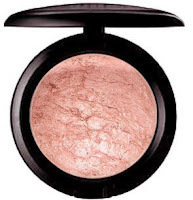 Kevyn Aucoin Celestial Powder - this absolutely glows on the skin. I'd say it's for up to tan skin tones. NYC - gold shimmer bronzer. I love wearing this under blush, it just makes colors pop! MAC Lustre Drops - These really melt into the skin. I have a more pink based which I use on cool skin tones and a gold one that works great for warmer tones. I'll often pair a shimmer powder on top to set the drops. MAC Sweet Flush MSF - One of my first favorites and I still love it. It has a pink and gold sheen. MAC Warmed MSF - I like using this gold/bronze on women of color, lovely! Cargo Dark Bronzer - This isn't really a highlighter but it makes blush shine! I use it especially for women of color...apply first then pop blush on top. Smashbox Artificial Lights - These are like the MAC luster drops, gorgeous! MAC Strobe Cream - I got this back when it first released. I like it more for mixing in with foundation. NARS Albatross - I don't know why I don't use it more often. I think because it's tucked in a drawer. It's got a gorgeous white gold sheen. MAC cream color bases - I have multiple of these in shell, pearl, and copper. They look great on the skin but don't last as long as my other shimmers. Giella Eye M Glam - Mario Dedivanovic's favorite product. I have similar loose shimmer powders to it. It's a nice mix of champagne, bronze and gold. I need to use it more often! Hope this post helped! What are your favorites highlighters? Let me know in the comments below! great post soft and Gentle is my everyday highlighter, EVERYDAY, im on my 2nd one im surprised it last waay longer than a year!! i also bought the Blonde msf such a pretty pink!! Hmmm very informative. I might pick up Mac soft n gentle highlighter. Do you have any tutorials on how to apply highlighter?